We’ve been wanting to try cooking something with mussels for a while, and finally got a good night off that was appropriate for wine and experimentation. We couldn’t find the recipe that I had originally had in mind, but did find this one, for Steamed Mussels with Pernod, Celery Root, and Saffron Aioli, from Epicurus via the I-Phone while we were out and about. It was absolutely amazing- certainly the best seafood that I have ever cooked, and probably the best shellfish I have ever had. I couldn’t find celery root, so just used celery, and used full-fat mayo because I couldn’t see buying the low-fat stuff. It was easy and just took a few minutes once you sorted through the mussels. We picked up some crusty sourdough to go along, lightly toasted, and it complemented perfectly. Offer this main course with plenty of crusty bread to soak up the delicious saffron broth. A crisp Sauvignon Blanc is good here, too. Heat 2 tablespoons olive oil in heavy large pot over medium heat. Add celery root, leek, carrots, chopped celery and 4 tablespoons parsley. Stir to coat. Cover pot and cook until vegetables are tender, stirring occasionally, about 15 minutes. Add garlic and sauté 1 minute. Add mussels, wine and Pernod. Increase heat to high. Cover and cook until mussels open, stirring occasionally, about 6 minutes (discard any mussels that do not open). Remove from heat. Season cooking liquid to taste with salt and pepper. Whisk 1/2 cup cooking liquid into aioli to make thin sauce. Ladle mussels and remaining cooking liquid into 6 bowls. Drizzle each serving with some aioli. Sprinkle with remaining 2 tablespoons parsley. 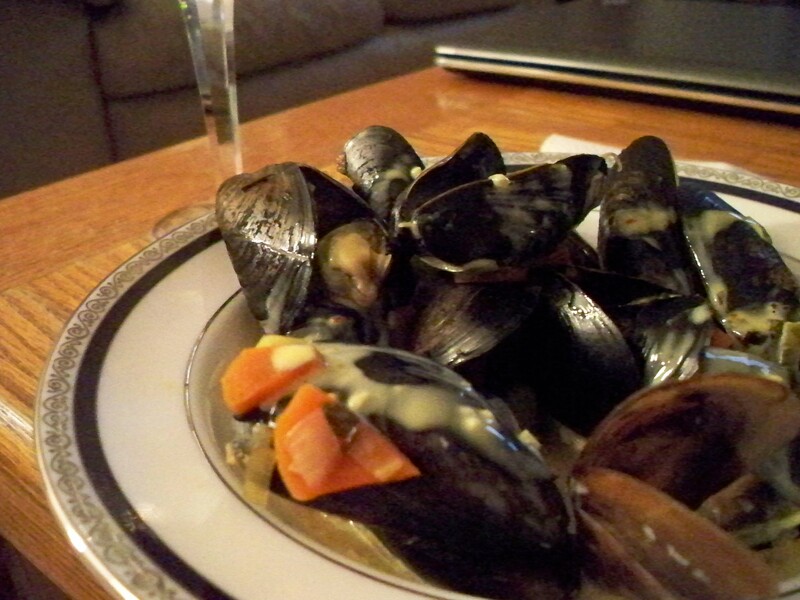 Serve mussels, passing re-maining aioli separately.